Our favorite Supers are BACK this summer with an all-new movie this summer. 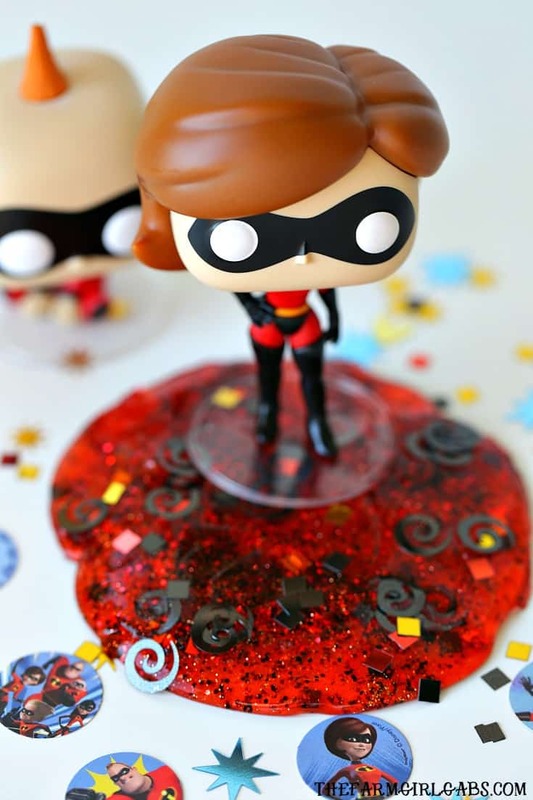 Make a batch of this fun Incredibles Elastigirl Slime to celebrate. And remember darling, no capes! What an INCREDIBLE summer this will be! The Parr family returns in the long-awaited Incredibles sequel, Incredibles 2. I don’t know about you, but I am super (see what I did there) excited they will be back. Their return to the big screen also means that I will once again get to see one of my favorite Disney Pixar characters – EDNA MODE! Yes, darling, she will be back as well. So you know I have a little obsession with creating lots of fun slime recipes. 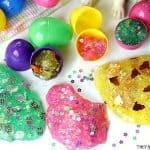 It’s amazing all the slime ideas you can create with school glue, glitter, dinglehoppers, and snarfblatts. So naturally, I knew I had to give Helen her own slime. She’s Elastigirl after all. And slime is stretchy too, right! It’s the perfect fit – Elastigirl Slime. To get started, you will need to fill two bowls with 1/2 cup water each. Add 1/2 cup of the clear glue to one bowl. Mix well and then stir in the one or two drops of red food coloring, fine glitter, and glitter confetti. You can add as much or little as you like. Add 1/2 teaspoon of Borax to the other bowl and mix together. Slowly stir the Borax mixture into the bowl with the glittered glue. It will start to get “goopy” immediately. Mix until all the liquid is dissolved. Slime, in general, is a great way to keep the kids busy. This Elastigirl Slime will provide an incredible amount of summer entertainment too. The Incredibles 2 hits theaters on June 15, 2018. Want to save this Incredibles Elastigirl Slime for later. Click the photo below to save to Pinterest. In INCREDIBLES 2, Helen (voice of Holly Hunter) is called on to lead a campaign to bring Supers back, while Bob (voice of Craig T. Nelson) navigates the day-to-day heroics of “normal” life at home with Violet (voice of Sarah Vowell), Dash (voice of Huck Milner) and baby Jack-Jack —whose superpowers are about to be discovered. Their mission is derailed, however, when a new villain emerges with a brilliant and dangerous plot that threatens everything. But the Parrs don’t shy away from a challenge, especially with Frozone (voice of Samuel L. Jackson) by their side. That’s what makes this family so Incredible. slime recipes here on The Farm Girl Gabs. How much slime does this make? I am looking to do this for a birthday party with 15 kids.